We've been without cable and DVR for more than a year, but we still had regular cable because the company never turned it off (we're still Internet and phone customers and overpay for that so I didn't feel too bad about that, although maybe I should?). 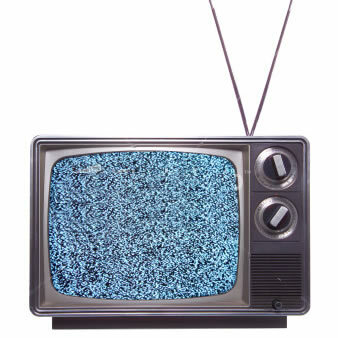 It was just the basic 60 or so channels, and I'd watch the networks and maybe one or two others on occasion (big fan of Hallmark and Lifetime for Christmas movies, and I watched the heck out of Big Bang on TBS). The cable company is also in a fight with the local NBC affiliate, so that signal is blocked through our remaining wall cable channels. My mom had given us an indoor antenna to try when we initially canceled cable (I forget why she bought it - maybe for herself and it didn't work in Indy?). Last week The Black List (on NBC) was new, so I used that as a reason to give the antenna a try. It works, and NBC is very clear as is Fox. I've been able to try a few times and get ABC, which is good because we like their weather guy (and making fun of their local news coverage - OMG). But for the life of me I cannot get CBS. All the stations are within 10-15 miles of us, and we can get some that are even farther away from the local CBS affiliate (WAFB if anyone is doing a search for "WAFB signal not working over the air" or something -- not that I have a solution yet). It has something to do with UHF vs VHF signal (VHF being weaker apparently, although the ABC station is that type too and I was able to eventually get it to work OK). ANYWAY, back to the actual problem - do we try another antenna, i.e. throw some more money at it? I can try to adjust the antenna a few more times (somewhere I read online that someone was able to get the signal by raising their antenna and the signal stayed even when they lowered it back). I know the channel (9) so I can just keep trying to force the antenna to search for it as I move it around, but so far it hasn't been able to lock on. If you're local and figure it out will you let me know? For the love - why can't anything just be EASY!?!?!?!?! We are going back to ballet today. Woe. When I contacted the dance studio they said all funds would be reset on June 30 so we could take a break but have to come back before that. Given our spring timeline that's not realistic SO we're going to do two more months and stop at the end of February. At some point we may just want to walk away from the money (Jane still says "I don't wanna go!") I'm so cheap though. SO CHEAP! I've stretched out my silver sparkle Toms shoes to the point they are comfortable. When I bought them they were so uncomfortable, but somehow they've become my go-to shoes (although it's taken more than a year -- I bought them from Zulily in November 2014 ... not that I wore them much before recently). I think the trick is wearing them with thin socks. My Bobs, which are similar and were handed down to me from my mom, have never felt uncomfortable and I can wear without socks. Maybe when it is consistently warmer again I'll try the sparkle Toms without socks, but for now I'm glad to have a pair of semi-cute and comfy slip ons. I still don't get all the fuss and they seem overpriced even if they're "giving another pair to a kid in need," but what do I know? We've re-arranged our sunroom to put my desk closer to a grounded outlet (joys of owning a ~1960s-era home). I think I'm used to it now, although my back is to the window. I've always had this window covered (clipping on a baby quilt -- CLASSY), but no official window treatments because Shawn likes it "clean" and "open." Well, it looks not so clean this way and there's no way to take it down/put it up without climbing on chairs or the table so it stays up, defeating the idea of "openness" too. The blanket does block the glare so I can work in the afternoons as needed, but still. If you have any (inexpensive) ideas for window treatments that can retract/be out of sight part of the time let me know. We have three big windows plus glass French doors (although I don't see us covering up the doors). We have a lot more rearranging and organizing left to do, but things are coming together for 2016. How's your New Year shaping up? Scene: Target checkout line. ~10:50 a.m.
Me: Checking my phone to pull up Cartwheel app for a discount (that didn't even apply anyway ... stupid, stupid, stupid), and because I'm connected to Target wifi I can see a new email message letting me know my 11 a.m. conference call (Google Hangout) would be starting a little late. Cue: PANIC, increased blood pressure, omigod-omigod-omigod! My heart is still racing thinking about it. Thankfully the call itself was good and productive, and we talked further later in the afternoon (while Jane watched a Thomas - lucky girl ... and lucky me that our Internet could handle streaming that video and the Google Hangout, although that was voice-only at least). I didn't check either the Google calendar or my pocket calendar when I made my "daily page" for today, which is an error on my part obviously. How do I get in the habit? Is this a reason why you have your calendar in the bullet journal directly -- or at least a list of dates w/ a line to input time sensitive appointments like that? I remember things MUCH better if I physically write them down. That's part of the allure of the bullet journal. But it only works if I WRITE STUFF DOWN!!! Another Christmas present from this year was a Keurig from my inlaws. I have had it on my wish list for a while but figured it was too extravagant, and it really is. This one can do the single cup brews AND brew a small pot of coffee. I immediately went to Amazon and ordered the reusable pods so I can just use regular ground coffee for both single cup and pot brewing. They work OK, but the best flavor so far is single brew with pre-made pods and selecting "strong" for the brew. 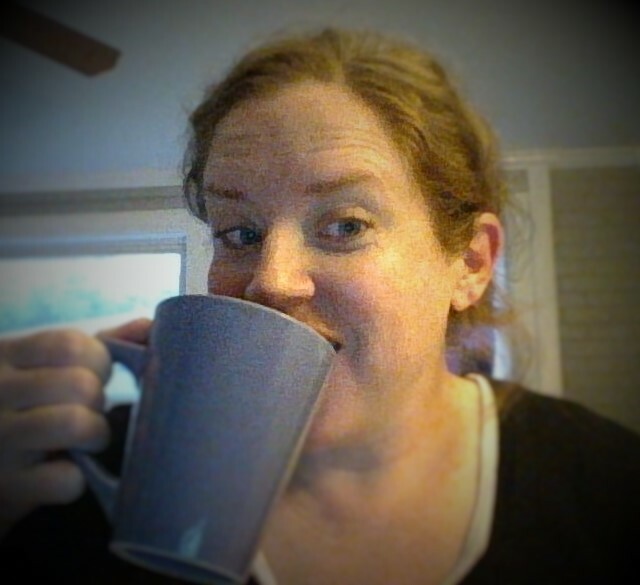 Even decaf tastes delish. I'm sure with a little more trial and error I'll get the reusable pod down (how much to put in, how much to tamp it down, etc.). Shawn's been out of town this week and his hotel room had a Keurig brewer and they provided K-cups. I told him to squirrel them away each day and bring them home to me! He said he has about 10 to bring and toward the end they started leaving him 3 per day thinking he must be a coffee fanatic. LOL at that because he really doesn't even like to try it. He accidentally ordered me a latte when I could only have plain coffee during our November travels, and instead of tossing it he drank it and was only MEH about it. Oh Shawn. I'm trying very hard not to overdo it on the coffee, although I'm pretty much drinking exclusively decaf. But it's so convenient (and reminds me of a few of my offices I worked in that had similar brew stations and I would drink SO MUCH COFFEE just because it was there). And since it's cool-ish here finally (for now) drinking something warm throughout the day is very appealing. The brewer can also do hot water for tea (or you can buy tea K-cups?) and also they make hot chocolate K-cups and other specialty type drinks that would have the milk-ish stuff pre-mixed in it. I'm not sure how I'd feel about that. So for now I'll stick with my mainly black, mostly decaf hot coffee and enjoy. SO -- at least part of the stewardship message is getting through a 4-year-old's skull, and I take this as strong evidence to support my fervent belief that kids belong in worship with us. I also hope my heart and mind can be as open as hers is, and that as a family we can take steps to increase our giving, even in a time of our life that's got some financial uncertainty, at least as far as my earning power goes. One of our projects for Christmas was to make these BEAUTIFUL frames for Jane's grandmas (also known as my mom and Shawn's mom). 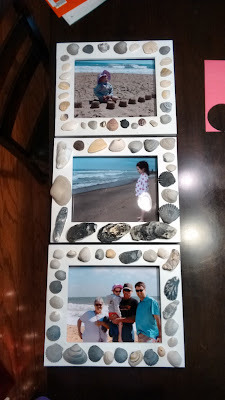 We collected a lot of shells on our beach trip to the Outer Banks in May, and this was a good way to use them. Shawn made the frames in his workshop, and he had glass cut to fit, added hangers, etc. I laid out all the shells and Jane decided which ones went on which frame. She worked hard on the placement. Then she decided who got each frame (I took all the pictures, and I decided who got which picture so put the chosen picture into the corresponding frame). They didn't travel so great -- some shells fell off in transit, but hopefully will be easy enough to glue on. Of course Jane chose frames with huge, heavy shells for her grandmas. Mine is the top one in this picture and it's my favorite (I love that sandcastle picture -- she's looking up and laughing at her dad flying her kite -- and it's only slightly Photoshopped in that I removed some trash/junk in the sand behind her). We already have it hanging in the living room. My mom got the second one pictured (obviously) -- I love Jane's carefree stance, wonder-full stare and adorable preschooler belly. The last one, for my mother-in-law, is a picture of the Walkers with their pride & joys -- everyone in their shades. Shawn also made a GORGEOUS stained frame, which we put a Jane picture in and also hung in our living room. It was less of a family affair though, and I didn't take a picture of it. He's quite the craftsman! After a lot of thought and many "are you sures?" we've decided to give up on ballet classes, at least for now. The traffic getting home after class is always terrible (and includes a scary left turn across Bluebonnet). The bottom line though is that Jane doesn't want to do ballet any more, and I don't want to have to cajole her every week, even if some weeks she has a good time. I also had already paid $85 for the "informance" (informal performance) that won't happen until MAY. I wish I had listened to my gut and just waited writing the check, but I didn't and it's non-refundable. When I asked if we could get the money back if we quit they told me she could "take a break" and we could apply those funds to tuition later (but I'm waiting on confirmation of that of course now that we've made our decision to quit). Half of me wants to just apply the $85 to January and February tuition and make a clean break after that, but this holiday break from the ballet class stress has been great and I'd like to continue that. I HATE the idea of possibly losing money, but we can try again in the fall (or maybe the summer? I'm not sure if they have summer sessions). Maybe we'll choose a Saturday morning class instead of an evening one. Jane is always better in the mornings, but I didn't want to give up our weekends. Maybe for just a couple of months we could swing it though. 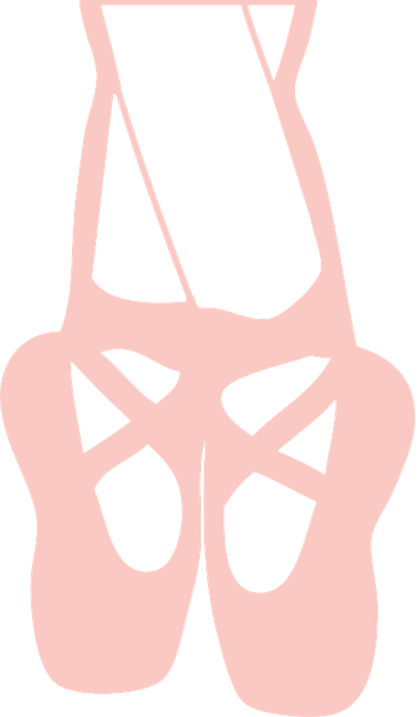 I really don't see us going long-term with ballet even if we start up again -- I have no problems with that, since this was just something "fun" to do that turned out not so much. I hate missing the opportunity to record and photograph her showing off what she learned (and she has learned some things), but not enough to keep making her do something she doesn't like. So we've signed up for the much cheaper soccer session -- no team, practices or games, just fun. And that will be our activity for the spring. I'm not the friendliest person, but are there tips to getting ON someone's Christmas card list? I feel like a reject since we barely got any Christmas cards this year. I sent out around 80, and I think about 5 were returned as undeliverable, so say 75 reached their destinations. We probably received 12 cards. I don't send cards only in order to receive cards, but it sure would be nice to get a few more in return! I wonder if people are just not sending out cards at all any more OR if we're not making the cut and I should take a hint and take people off our list. What a crazy "problem" to have. Good grief. So I won't STOP doing cards, at least not while I have photogenic offspring. I get a lot of pleasure from the whole process. I love receiving mail almost as much as I love sending it ... and I just don't have many opportunities to send snail mail these days (Christmas cards and thank you cards are about it!). If you want a Christmas card from me next year and didn't get one this year will you email me your address? And then I'll give you my address, and we can be Christmas pen pals... Thanks! Because I am cheap (frugal?) I don't have a Hulu account, so I've been missing The Mindy Project that moved there from Fox (which is still dead to me). My mom did a free week trial from Hulu over the holidays (although it said it was a free month in the original email -- I know because I almost signed up myself). She didn't cancel soon enough because of another shady email technique and so paid $7.99 for the month (or maybe just for the remaining three weeks? I'm not sure on that). I'm not sure where the show will go from here, because the end seemed pretty clear that she was going to stand up for herself and break up with him. They do have the baby together, and they work together so it's not like they'll just write Danny out of the show (I think?). A point of contention in their relationship is whether she should stay home or go to work, and he wanted her to have another baby immediately, which doesn't make much sense since, as again they're supposed to be DOCTORS. I may sign up for a free trial of my own after the rest of this seasons episodes air and watch them then. I'm definitely not paying $8/month (so basically $2/show because they add one to the queue ever week) for a show that's infuriating more than it's funny ... although it is still quite funny and I like the Morgan character v. much.